Starbucks' Holiday Share Event is back! When you buy one holiday drink you can get one free to share! The holiday drinks this year include Chestnut Praline Latte, Peppermint Mocha Latte and Caramel Brûlé Latte. Although I have seen in the past people order the Egg Nog Latte and some other "holiday" type drinks and get this offer too, of course ask before ordering. 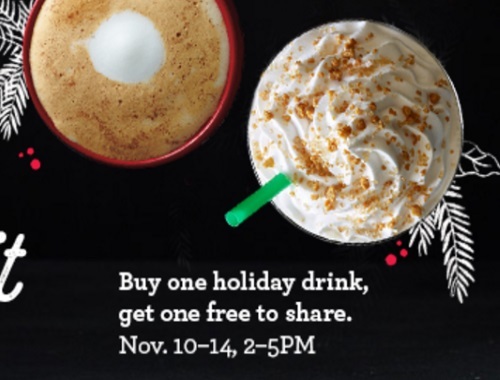 Offer is valid November 10-14, 2016 from 2-5pm (Starbucks Rewards members get an extra hour until 6pm). At participating stores. Free drink of equal or lesser value.